Colorectal cancer is one of the most common types of cancer disease in both men and women in Singapore; both genders carried the same risk. Factors have been connected with increased risk for colorectal cancer are the genetic inheritance, smoking, eating red & processed meat, lack of exercise, and excess body weight. Besides, about 90% of colorectal cancer is discovered in patients over the age of 50. Hence, adults older than 50 years old or with the family history of the disease are encouraged to visit specialist clinics or local hospitals for colon cancer screening. Screening helps to detect it before symptoms appear. 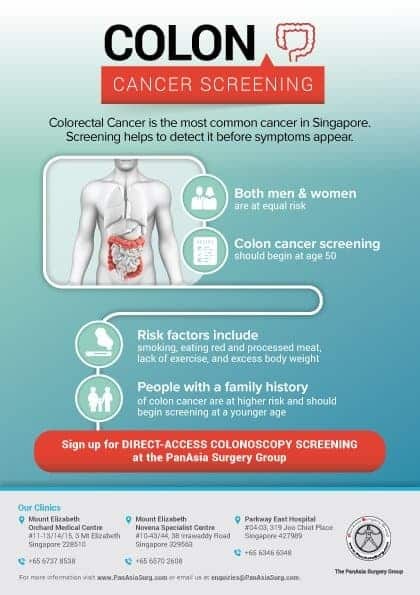 Sign up for Direct Access Colonoscopy Screening at the PanAsia Surgery Group.